Relatively affordable with fascinating history and even a little Harry Potter mystique, this tiny country is suddenly on everyone’s must-visit list. A view of Porto from across the Douro River. A DECADE AGO, when teenager Hugo Resende would roam the stacks of the century-old Livraria Lello bookstore in downtown Porto, he was often the only customer in the place. Today, the line to get in typically stretches more than a block. Lello has become such a must-do attraction in Portugal’s humming second city that the bookstore now charges each customer a 4 euro entry fee. Although locals like Resende have largely stopped going to the store, the number of people paying to get inside on the busiest days tops 3,000. I should acknowledge that there was some special magic involved in the Lello bookshop’s reversal of fortune. A few years ago, word spread about an interview J.K. Rowling had apparently given in which she credited Lello for having inspired her while she wrote the first Harry Potter. Long before she became a publishing supernova, Rowling had lived in Porto, during her brief marriage to a Portuguese journalist. Never mind that the interview may well have been apocryphal and her connection to the two-story bookshop exaggerated. Overnight, Potter pilgrims began flocking to Lello to pose on its grand circular staircase, which they became convinced had been Rowling’s template for the grand (if straight) staircase in Hogwarts. The bookshop’s stunning turnaround serves as a metaphor for Portugal itself. This long-overlooked sliver of a country in southwestern Europe has suddenly become the hottest travel destination around, named by several outlets as the place to visit in 2017. Offering good food, rich history, great vistas, a temperate climate, and just about the closest thing Europe has to a bargain, what’s not to love? Yet Portugal is also a reminder to be careful what you wish for. As with the lines at the bookstore, sometimes you get more good fortune than you can handle. The Potter connection is only one small piece of Portugal’s swelling popularity, which seems both sudden and entirely overdue. The country is small, but its variety of offerings is vast. In the north, there’s romantic Porto and the wine mecca Douro Valley. In the south-central region, there’s the bustling, cultured capital city of Lisbon as well as the story-land castles of Sintra. And in the far south, there’s the beach-rich, wind-swept playground of the Algarve. 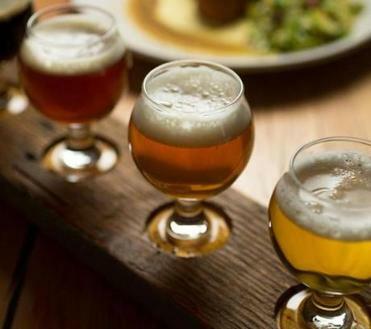 Two beer-loving friends check out the good stuff on tap from Ipswich, Mass., to Freeport, Maine. Locals say tourism began its rise about five years ago, when Portugal came to be seen as a safer, fresher alternative to other well-trod destinations. The popularity has built on itself every year since. “We were a gem waiting to be discovered,” says Porto tour guide Claudia Macedo. There is one kind of tourist that Portugal has always attracted. Each year, about 5 million religious pilgrims descend on the small central town of Fatima, to visit the spot where the Virgin Mary is said to have begun appearing before a trio of peasant children in May 1917. This surge in tourism around the country will surely see a record turnout in Fatima this year as well. After all, among the pilgrims expected for the 100th anniversary celebration is Pope Francis. Unless you want to be part of that biblical deluge, you would do well to avoid a trip to Portugal in mid-May. But the country is a good bet most any other time. If you have only a week, you can soak up a lot of Portugal’s richness simply by splitting your time between Lisbon and Porto, making two brief detours to the lovely villages of Sintra and Obidos while you’re traveling between the country’s two biggest cities. Harry Potter fans have turned century-old Livraria Lello bookstore in Porto into a bustling tourist attraction. THE BEST PLACE to take in the gorgeous Lisbon skyline is from the Castelo de Sao Jorge, built on the site of a pre-Roman fortification atop one of the capital city’s highest hills. The castle has been remodeled so many times that it feels about as original as the peacocks strolling the grounds, but the views it provides of the city are arresting. Lisbon’s population of about 600,000 is comparable to Boston’s. But its landscape of whitewashed buildings with red terra-cotta roofs makes it look less like a national capital than an unusually large Mediterranean village. Most of the city — which sits on the northern banks of the Tagus River, not far from the Atlantic — was destroyed in 1755 by the triple whammy of successive earthquakes, a tsunami, and a massive fire. Lisbon was quickly rebuilt, on a grid and with a uniform color palette. In the three and a half centuries since, the city has wisely resisted the urge to construct the kind of skyscrapers that would undercut the beauty of its restrained, hilly landscape. The Alfama, one of the few medieval neighborhoods to survive the earthquakes, sits at the base of Castelo de Sao Jorge. Its shaded and winding alleys transport you to the days of the Moors, who ruled the city for four centuries, beginning in 714. The Old World ways live on in this quarter, from residents hanging their wash out their windows to merchants drying fish in the sun. The Alfama is a great place to spend an afternoon wandering — and enjoying it even when you get lost. Once you regain your bearings, head to the other side of the castle to get to Rossio Square, the heart of Lisbon. The square’s majestic fountains, imported from France, and grim history of hosting occasional public executions make it Lisbon’s version of Paris’s Place de la Concorde. Lisbon is a safe city, but beware that Rossio’s beautiful tiled sidewalks are home base for pickpockets. The adjacent downtown Baixa district is the perfect contrast to the alleys of Alfama. Baixa sits on an orderly grid of arrow-straight streets lined with shops and outdoor cafes. For lunch, dodge the relentless menu-pushers outside and head down Rua dos Correeiros for a reasonably priced meal at the cafe of the Hotel Santa Justa. (The tender bochechas de porco, or braised pork cheeks, are a great choice.) The hotel is close to the ornate Santa Justa Elevator, a nearly 150-foot tower that rewards visitors to its observation platform with unobstructed city views. After lunch, make time for a stop at the Conserveira de Lisboa. Although smaller than many American mudrooms, the shop is a time-capsule treasure, with floor-to-ceiling shelves packed with colorful tins of sardines, tuna, and anchovies. Grab a few tins of the tuna in picante sauce to take home and you’ll never look at Bumblebee the same way again. The long avenues of Baixa eventually lead to the vast waterfront Commercial Square (Praca de Comercio). Rimmed by the arches of handsome buildings, the square highlights Portugal’s historic connection to the sea, as well as its willingness to build timeless architecture with some of the riches it accumulated from all that seafaring. From the plaza, you can see in the distance the 25th of April Bridge, the suspension bridge that is often compared to San Francisco’s Golden Gate. On clear nights, it stands ready as the perfect backdrop for photos capturing Lisbon’s movie-quality sunsets of deep red and orange. The bridge’s name is a nod to the peaceful revolution that toppled the country’s half-century dictatorship under Antonio Salazar (and his short-timer of a successor). Its previous name? Yup, the Salazar Bridge. (Harry Potter fans will recognize the dictator’s surname as the first name of Hogwarts cofounder Slytherin.) A quiet but ruthless former college economics professor, Salazar ruled Portugal from 1932 until 1968, when he fell and suffered a cerebral hemorrhage. After he unexpectedly regained his ability to speak, his aides didn’t have the heart to tell him he had been replaced, so they let him live out his last two years thinking he was still in charge. Wherever you go in Lisbon, the past is never far. Walk down a side street, and it won’t take you long to see ceramic azulejos tiles adorning the exterior of an old church or to hear the aching tones of fado — Portugal’s two-century-old equivalent of the blues — emanating from a pub. For a serious dose of history, head to the Belem neighborhood. Inside the Jeronimos Monastery, you can view Vasco da Gama’s tomb. Across the street on the water is the famous Belem Tower, as much a fixture of tourist photos here as the Eiffel is in Paris. And just up the block from the monastery, you can devour the national snack of Portugal (or at least Lisbon), a custard puff pastry concoction called pasteis de nata. At the Pasteis de Belem bakery, they’ve been using the same secret recipe to turn out these warm confections since 1837, when they got sugar from a refinery attached to the monastery. The bakery sells at least 20,000 of these cinnamon-dusted pastries every day. “There’s another reason the bakery is so popular,” says veteran tour guide Matilda Mendes. “There are no public restrooms by the monastery.” For her, the absence of adequate facilities at such a popular tourist site is a sign of how unprepared Portugal is for the surging wave of tourism. 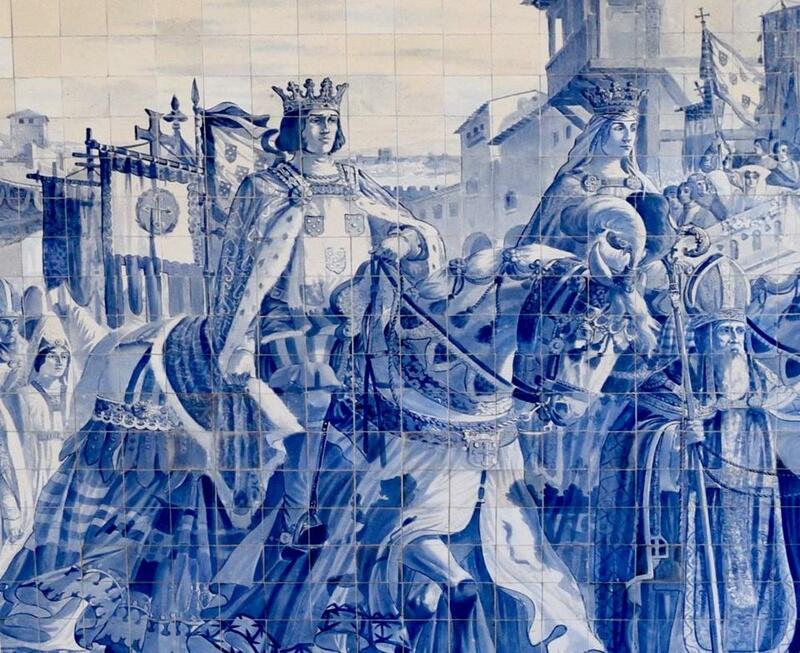 For all its history, however, Portugal never seems trapped by it. Instead, it projects a refreshing blend of old and new. This can be found in the creative reinterpretation of classic Portuguese cuisine on the menu at Belcanto, celebrity chef Jose Avillez’s splurge restaurant that earns its two Michelin stars five nights a week. A much bigger (and cheaper) way to experience New Lisbon overlaying the old is through the explosion of “urban art.” Spurred on by a city initiative in 2010 that attracted artists from around the globe, Lisbon’s pulsating urban art scene has turned abandoned buildings into massive canvases for striking murals. Most neighborhoods now showcase at least a few, though the Picoas district offers a jackpot of popular favorites, including “the Lizard” and work by Os Gemeos, the Brazilian twin brothers who also made a splash in Boston with their temporary mural on the Rose Kennedy Greenway. A great place to grab a drink and soak up the urban art scene is around Cais do Sodre. There, overlooking the Tagus River, you’ll find Vestigius, a funky wine bar and tapas place. Next door is the Underdogs art store and cafe, where you can get coffee and sign up for an urban-art guided tour. And, if you’re artistically inclined and feeling inspired, you can even purchase a few cans of spray-paint there, available in several hundred shades. (Check in at Underdogs or the Urban Art Gallery for guidance on the current places where tagging is allowed.) What better way to leave your mark before you leave Lisbon? Pena Palace in the town of Sintra offers priceless views and playful, colorful architecture. Porto appears to be not just more industrious but also more traditional and religious. But it is no less charming. You can travel between the cities in two and a half hours on a high-speed train. But if you’ve got the time and have access to a rental car, driving will allow you to make two worthwhile pit stops. Perched in the mountains just north of Lisbon, Sintra is a UNESCO World Heritage Site, largely for its brightly colored palaces. The standout is the Pena Palace, the playful architectural mashup built by King Ferdinand II in the 1840s. As you enter, you half expect to see kings’ men scouring the grounds for a missing glass slipper. In fact, it was home less to fairy tales than to the 19th-century version of a TMZ scandal, springing from Ferdinand’s marriage to an opera-singing single mom. Up the highway a bit is Obidos, a picturesque walled town with winding streets and money views at every turn. It’s also the best place in the country to sample ginjinha, the sour-cherry liqueur classically served in shot cups made of chocolate. Obidos was a wedding gift from a Portuguese king to his wife, back in the day when royals kept separate summer palaces. Those two stops are teeming with tourists, so by the time you get to Porto, you’re ready for a working city where the people standing next to you at the train station are more likely to be heading to their job than clutching a copy of Lonely Planet. And speaking of train stations, Porto’s is a must-stop even if you don’t plan to ride the rails. The fully functioning station is also part museum, thanks to the expansive and extremely realistic paintings on its tiled walls that tell important chapters of the nation’s history. The exquisite detail of the painted tiles adorning the walls of the Porto train station make it a must-stop. 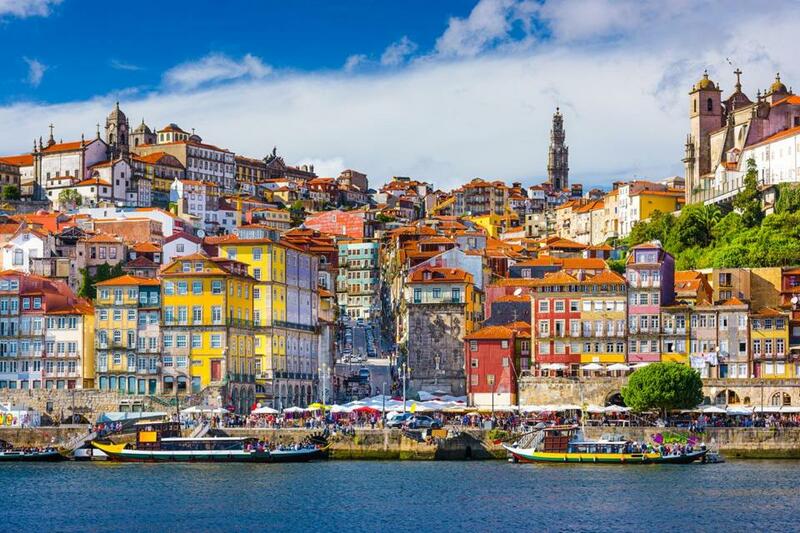 Porto is a handsome, elegant city, with buildings made of granite, its structures packed onto the hilly landscape and covered with colorful tiles. Since the Porto Cathedral, sitting atop the city’s highest hill, was long the seat of the nation’s most powerful bishop, it should come as no surprise that there are churches virtually everywhere you turn. Despite all the hills, Porto is compact enough to be a walkable city. Take a stroll on the path along the Dom Luis Bridge that connects Porto’s riverfront Ribeira neighborhood to Gaia, the city on the other side of the Dhouro River. Gaia is home to a wide array of port wine lodges and cellars offering tastings and tours. The city also features an interesting food scene, from the higher-end restaurant called Book, at the Hotel Infante Sagres, to inexpensive cafes selling Porto’s comfort-food classic called francesinha. The baked meat-and-bread sandwich is smothered in melted cheese and a tomato-and-booze sauce. And make time to visit the working Mercado do Balhao, a large indoor farmers market that attracts more locals than tourists. I’d never recommend wasting one of your European meals at McDonald’s, but Porto’s Mickey D’s is worth a visit. That’s because it is housed in the exquisitely restored former Imperial Cafe, featuring stained-glass windows behind the counter and bas-relief sculptures on the walls. Harry Potter fans opt for a different bistro, though, queuing up outside the Majestic Cafe, which Rowling’s former husband has said the couple frequented. A commonly told story is that Rowling mapped out a good deal of the first Potter book on napkins while hanging out at the Majestic. Many Potterphiles in Porto don’t buy it, though. They note that during her Porto years, Rowling was working low-paying jobs. The expensive Majestic, where the waiters wear white jackets and white gloves, would have been an unlikely hangout for a struggling writer.